Osteoarthritis is the most common joint disorder and a leading cause of disability which is on the rise due to many reasons, such as trauma, infection or age. It is a chronic, degenerative joint disorder characterized by joint pain, tenderness, limitation of movements, crepitus, occasional effusion, and variable degrees of local inflammation, without systemic manifestations. Pain from knee is a key symptom in the decision to seek medical care and an important antecedent to disability. While mainstream medical care has done more harm to a patient than good due to their inevitable side-effects, anti-arthritic herbs described in the Indian system of medicine are being used worldwide effectively in different proportions and combinations; and considered to be safe remedies for the management of Osteoarthritis. 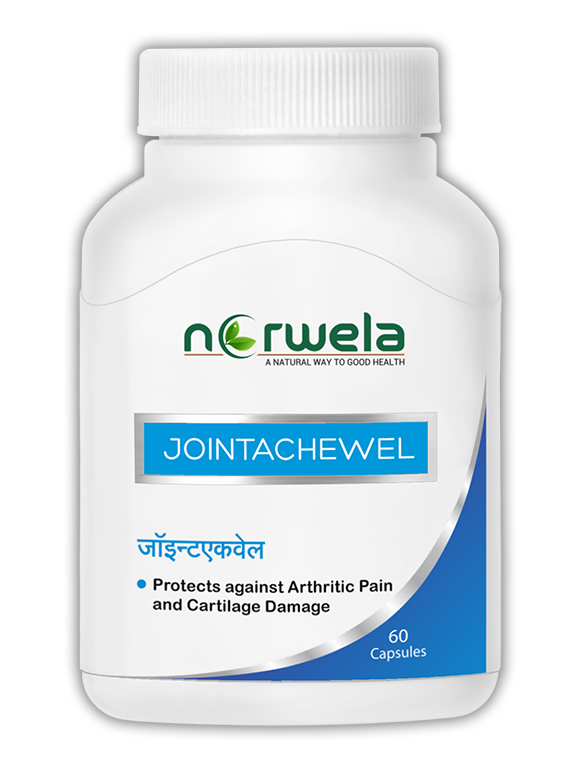 JointacheWel by Norwela is an excellent medicine with a unique combination and proportions of herbal extracts and is an outcome after years of research, especially for patients who face an increased risk of joint pain. Herbal extracts used in JointacheWel provide quick relief from pain & joint stiffness. It is also known for its excellent cartilage protection action. Even recent studies conducted in USA on the safety and efficacy of JointacheWel as well as extracts used in it, have concluded that it is truly safe and beneficial for joint support.